As part of NASA’s Commercial Resupply Services Program, October’s mission will be the first of at least 12 unmanned Dragon flights to the ISS. The US government hopes that these flights will encourage private firms to eventually take over manned and unmanned near Earth orbit flights for government and commercial customers while NASA concentrates on deep space missions. The Dragon spacecraft already made history in May, when it became the first commercial spacecraft to visit the ISS in a test flight. After rendezvous, the ISS crew captured the space freighter with one of the station’s robot arms and docked it. The craft was then unloaded and later returned to Earth with experiments from the station. 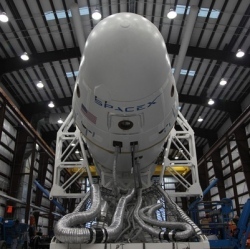 Dragon was built and is operated by Space Exploration Technologies Corporation (SpaceX), which also builds and operates the Falcon 9 booster used to send it into orbit. It’s a free-flying, reusable spacecraft that stands 4.4 meters (14.4 ft) tall and is 3.66 meters (12 ft) in diameter. Weighing 6,000 kg (13,228 lbs) at launch, it consists of a pressurized capsule and an unpressurized trunk that houses the craft’s solar power array. Attitude control is by 18 redundant Draco thrusters and on completing its mission, Dragon returns by parachute for a water recovery before refurbishment and reuse. Currently, Dragon is an unmanned freighter, but a manned version is under development and should fly in the near future. Beyond that, SpaceX plans to make Dragon part of a launch system where every component is completely reusable and returns to earth under its own power. Though the immediate plans for both the manned and unmanned versions of Dragon are for them to operate in Earth orbit, SpaceX eventually hopes that Dragon will be used for a landing on Mars sometime in the next decade.